My leopard gecko went missing three-four days ago, and we have not been able to find him. We have checked everywhere multiple times, but could he have crawled down a flight of steep stairs? He has escaped before, but found later the same day. We also tried setting the shoe box “trap”, and looking for him in the middle of the night. (About midnight-ish) Any advice??? The comment doesn’t appear until I approve it, which is why you probably felt you needed to post multiple times, but now I’ve approved it. There’s not much more you can do besides what you’re doing. Make food and a hiding place available, keep looking at night and hope for the best. I have lost some leopard geckos that were never found alive, but I also had one turn up in my downstairs neighbor’s build in linen drawer after about 3 weeks, one turn up in my basement after 2 years (!) and a micro gecko hatchling that got away turn up in the living room after 4 months. Don’t lose hope. Thank you for the article, it has renewed my hope. I have lost my gecko twice before but it was in my bedroom before, which was only about 120 square feet. Both previous times I found him in under 24 hours. Now the terrarium is in the living room in a new home and all the bedroom doors were open as well, which gave him about 1,000 square feet to roam in about 12 hours before I noticed he was gone. It has been 3 days and I am very worried, and thought that maybe it’s been too long and that my chances of finding him delcline each day. 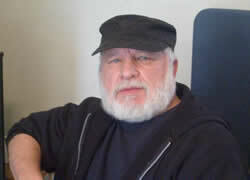 Because of your article I will continue to look for him day in and day out. Thank you. Good luck. 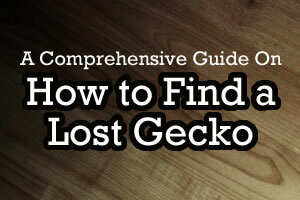 Also check out the article “Found” where I describe finding a gecko that had been missing for 2 years! Keep providing shelter and keep looking. No guarantees. I found one of mine after 2 years! He’s dark colored because he’s cold and stressed. His tail looks deflated because he hasn’t had much to eat. He’s also stressed about being found, but it’s a good thing you found him. 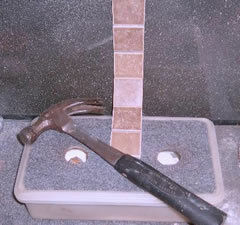 See if he’ll tolerate a short soak in about 1/2″ of water which should help to rehydrate him, especially if he’ll drink. You could crush up a mealworm or cricket and rub the guts on his nose to see if he’ll lick some off. Otherwise, keep him quiet, without handling him too much, keep offering food and hope that as he calms down from his “adventure” he’ll start eating again. If you’re really worried about him (after you’ve given him some time to relax and start eating on his own), you could consider a vet visit. So I had a rather healthy female Leopard gecko and unfortunately she escaped.To be honest, I cried for 2 hours while looking for her. I set up hides and I put out a water dish for her. After a couple weeks I hadn’t gotten. He slightest clue that she could still even be alive. At that point, I had just about assumed she was dead. I still left water out for a slight chance of hope and I still didn’t remove the hides. I lost her during the summer, around July. It is now November and I looked at her water dish and found some poop on it. Now I don’t know what to do! 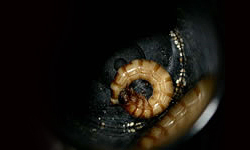 keep a hide near the water dish and put a bowl of mealworms out if you can. Keep watch there at night. They tend to poop in the same place, so you could likely find her. It wouldn’t hurt to keep a small dish of calcium with vitamin D3 there as well. Maybe you could dust the area with flour in case there are little gecko footprints! Check out the Gecko Time story called “Found” (check geckotime.com/archives) for the story of my gecko that was missing for 2 years! Wow, two years! I have some hope now. I placed her hide nearby the water and sprinkled flour. Now all I need to do is wait until night. Thanks for responding. Hi my sis gecko Iliad gone into a hole in corner of bathroom. Will he for sure come out ? I’ve placed his cage and food and water out. Should I keep lights on or off ?? Keep the lights out so the gecko feels comfortable in the night time. Put a humid hide near the place where he is because it will be easiest to catch him if he gets himself into the hide. Hopefully you’ll be able to catch him soon. This article makes me worried because I just got a leopard gecko I have a Cage cover for it and nothing for it even crawl up with but did you have any of this or did you allow them to run freely. I wouldn’t worry but I have a crab in another tank and dogs that would gladly like a snack but I do not want to have a gecko snack thanks. 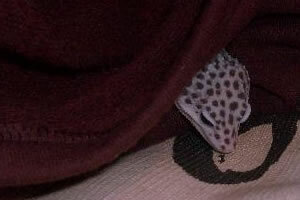 I did have a gecko escape once when the cage cover was left open a bit. I don’t know how she managed it. Your best bet is just to keep the cage covered (leopard geckos don’t do well running free) and then you won’t have any problems. My crested gecko got out about a month ago. Part of the habitat he was in was left open and he got out. I haven’t been around to look for him and I don’t think my mom tried putting out water. He’s also only about 3-4 months old by my guess. Still too small to actually gender yet. I’ve been reading and looking behind things, I’m leaving out water tonight. I just wonder if you think that one as young as mine after so long would still be findable. I know you mention one being found after 2 years. Should I keep looking? It never hurts to keep looking. Yes, my leopard gecko was found 2 years later after escaping as a hatchling. I also lost a hatchling SW banded gecko that was only 1″ long (they’re only about 3-4″ as adults) and found her after 4 months. When looking for it, look up on the wall as well as down on the floor because it’s an arboreal gecko. One of my cresties got out a few months ago and I did find her on the floor a week later. My Gecko just went missing about a day ago. I don’t understand how he could have gotten out though as he cant climb, and all I have are two little hiding caves. Any idea how he could have gotten out? The first gecko I ever owned managed to escape from a 20 gallon tank where the cover was open about an inch. She also could not climb and to this day I don’t know how she got out. It happens. Maybe they have some super powers when we aren’t looking! I’ve had other geckos missing anywhere from 1 day to 2 years and found them. There are others I haven’t found. Follow the suggestions in the article, look after dark and don’t give up. Good luck. 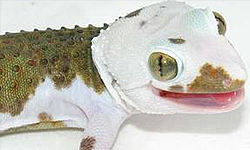 Wild geckos (even more than other geckos) are “programmed” to escape from predators, and that’s how they perceive you. If the gecko you brought in is arboreal (usually hangs out on trees or walls), look up and maybe you’ll find it. If not, look under things. You may or may not find it, and it may exit your house on its own. Good luck. What kind of gecko was it (I’m betting on house gecko) and where are you located? Ours has just turned up tonight after 9 months in the bathroom. Escaped behind the toilet. Lost forever. Bought another as son upset. Can’t believe it! Apart from being paler in colour his tail is fat and he’s ok! Not a clue how he’s survived. Now scared to overfeed him etc in case I make him ill.
Congratulations! I’ll bet there have been fewer loose crickets and spiders in your house during the past 9 months. Our gecko has just turned up last night! 8 months after he disappeared into a hole behind the toilet. He looks well- plenty of meat on him … but a bit pale. We’ve made a makeshift home as his other has been taken over by his replacement- oops!! Presumably it’d be a bad idea to put them together. Any advice on careful care for next few days? Don’t want to bombard him with food / heat in case it makes him ill – what should I do!!! Hi. I lost my lizard about 10 months ago and I just found him next to me at 11:30 at night. Yes, I did give up all hope.My mom never did. I love her for it. At first, I actually thought someone in the neighborhood lost a leopard gecko. I grabbed my camera with a video of me playing with her and realized it was… Don’t do what I did. NEVER give up. Try as hard as you can and hope. You WILL find your lizard. Have a great day. 1) Could it have been eaten, do you think? 2) Do you think it knows not to try to keep warm in a rabbit pen? I’m going to try your recommendations here… I’m​ worried that I don’t know what will attract him since he was only with us a few hours. I’m​thinking of damp towels around the shoe boxes, flour around the boxes, and filling the six food trays in each corner of the living room. We have a very open floor plan on the first floor. 3) Do the hatchlings go up and down stairs very easily? I’m hoping to find him soon. He’s a hatching from the fall. I think the lady said that it was “hatched” in November. I look forward to your response before the end of the night. I’m a school bus driver and don’t think I’m going to be able to sleep tonight! I need rest. I couldn’t focus all morning while I was driving. Totally unsafe. I’m so sad and mad at myself for not sealing that 2-3 cm hole that he couldn’t possibly squeeze out of… But DID! I’m sorry you’re having to go through this, and I hope you can find him. Don’t worry about him being too cold –room temperature is fine for him. I doubt the rabbit ate him. Check at night. Check along the walls and be sure to look up as well as down to find him since he may climb. They can get out through very small holes, as you can see. Good luck. You will not believe that hours after I sent you the below email, my Son was downstairs playing and watching TV at around 12:15 AM. He had all the lights on as well. And Get-go walks right on out from some boxes in the corner. He hops a little towards my Son. My Son runs up the stairs to wake me up that he found Get-go. I couldn’t believe it, until I saw it, and it didn’t resist us as we guided it into the container we brought him home in. I set up a smaller critter keeper until I get a 20 gallon one with a proper covering! Get-go didn’t look dehydrated at all which led me to believe that my water bottle contraption worked in keeping him hydrated the past 6 days! He was drinking and eating right away when I put him in the critter keeper! Thanks for giving me hope! Congratulations! I have also had some amazing gecko “finds”. All of these stories are give me some hope, thank you!! My almost 3 year old Leachie Gecko, escaped Friday night. o.O Has been one of the worst weeks for my Wife and I. We have turned the house upside down, emptied closets,looked on top of every exposed bit of furniture, on top of blinds, even bought an endoscope to look places we can not get to without risking injuring her if she was there, and placed 12+ treat dishes throughout the house and also using a night camera on time-laps looking for movement. All with no luck at all. I will keep holding out hope and encouraging. Any ideas you have are greatly appreciated. Good luck. I’ve found geckos missing anywhere from 24 hours to 2 years! I found her!! My Leachie (who is ironically nicknamed Pickle) was found, of all places in a box of PICKLES!! She was at ground level in the bottom box in the corner of the pantry, very strange place for a Leachie. She was so excited to be found that once I got close to her tank she started to try and jump back in! A bit dehydrated and very scared but she is alive and home. My wife and I probably sat crying for a good 20 min after finding her. Great news! I guess it’s lucky you didn’t name her Ice. Our leopard ghecko escaped a few days ago and she’s now under the fridge. We’ve tried enticing her out with mealworms and crickets, but she won’t come out into the open for us to catch her. Any tips, apart from extreme patience?! Thanks. do your best to block off the area around the fridge so she doesn’t get away again and then slowly move the fridge out of its area. Be prepared to grab her. Thanks, I’ll give it a go. Was too nervous to move it out, hoping she’d come out at night, but she’s just staying out. Look everywhere you don’t think they are! My crested gecko escaped a week ago and I just found him in the basement bathroom. There is hope to find your lost pets who got out in your home. Good luck everyone! Thanks for all the advice too. My only suggestion is to follow the recommendations of the article and hope for the best. I have 2 cats and have found many geckos despite that. I hope to have an article coming out soon about great gecko finds. Lost leopard gecko. I lost her sometime through the night and don’t know where to look or how to set traps. We recently got a puppy and have been putting a lot of attention on it. I don’t know if she could’ve felt neglected and ran away or if that’s even possible. Otherwise I don’t even know how she got out. Sometimes they get out in unimaginable ways. Read the article again and follow the suggestions. 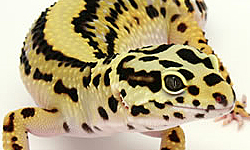 Many people have successfully found their leopard geckos this way. I lost my baby Mediterranean house gecko in my house and I put down wet paper towel cause he likes that, wish me luck cause my moms gonna flip. Keep an eye out for him. He’ll come out again. Throw a towel over him so you don’t get bitten. Is it likely that he would go down a whole flight of stairs (the room his tank is in is on the top floor)? And could he squeeze under a door and make it into the basement? (He’s full grown and was a healthy weight before he escaped) And what about air vents on the ground? I can hardly stick a finger through it, so I’m hoping he wouldn’t have made it into one of those. One thing to note is that I’m very confident my cats would not harm him, and we do not have any other pets that could do anything to hurt him.